(August 27, 2018) — Since 2011, a partnership between Georgetown University and the California-based Lawrence Livermore National Laboratory (LLNL) has given biotechnology graduate students the opportunity to intern in LLNL’s renowned laboratories. The internship program is an extension of a 2009 agreement that included the exchange of ongoing national and international regulatory and public policy expertise from Georgetown and big data, biosecurity, climate change and disaster management expertise from LLNL, whose mission is to use science and technological innovation to advance the nation’s defense. Faculty members from the Department of Biochemistry and Molecular & Cellular Biology and administrators from Georgetown’s Biomedical Graduate Education (BGE) met with John Knezovich, PhD, then-director of university relations at LLNL, in 2011 to develop the curriculum for a summer internship program for biotechnology graduate students. 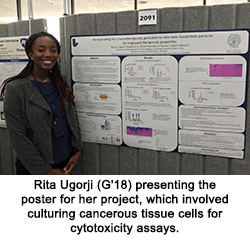 Subsequently, LLNL has hosted several Georgetown biotechnology students every summer for a 10-week full-time internship, both in its labs and the Innovation and Industrial Partnerships Office. 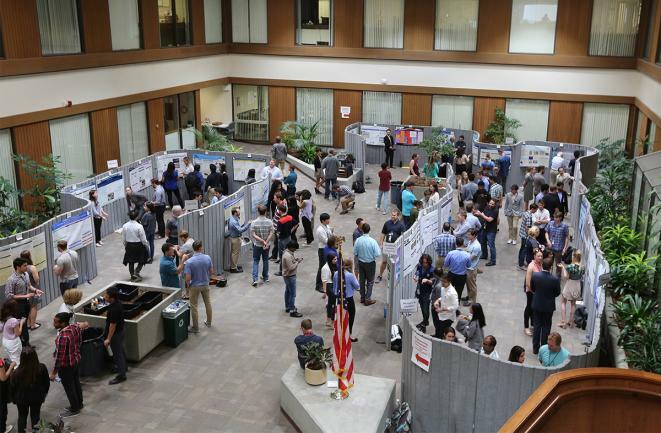 Toward the end of the internship, LLNL holds a poster symposium, allowing students to communicate their projects to researchers and peers. In addition to hosting students every summer for internships, LLNL scientists participate in a seminar series via teleconference for both biotechnology and biochemistry graduate students. Michael P. Thelen, PhD, a biochemist in the LLNL Biology and Biotechnology Division, has hosted Georgetown summer interns in his lab for the last four years and is one of the many supporters of the Georgetown internship program. Thelen believes interns from Georgetown add significantly to the technical and scientific aspects of his lab’s projects. “We are able to achieve more when they are working with us, and in some cases, our results have benefited greatly through their research findings,” he said. While bringing their talents to the labs where they intern, Georgetown students gain research experience from an institution known for its high-level technology and scientific discovery. They also receive an opportunity to practice patience in a laboratory setting. Working with Thelen, Arnechia Harper (G’18) spent the summer studying how increasing the growth of certain bacteria yields more efficient algal growth. That in turn increases the production of biodiesel, she explained, a more cost-effective and eco-friendly option compared to petroleum diesel. Harper spent hours mastering a highly advanced microscope at LLNL, adjusting its light exposure and other settings to capture quality pictures of the algal bacteria she studied. “Interning at Livermore instilled in me that perfection takes time and practice,” she said. 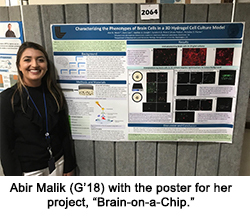 “Brain-on-a-Chip,” the LLNL project that Abir Malik (G’18) worked on, aims to advance the screening of drugs and toxins that lead to identifying treatments for diseases and personalized medicine. “Georgetown taught me to be patient with my work and that has helped a lot this summer,” she said. Because of both its commitment to scientific excellence and its location on the eastern edge of California’s San Francisco Bay Area, interning at LLNL offers Georgetown students unforgettable experiences. In addition to working with his mentors in the Innovation and Partnerships Office, Dylan Hernandez (G’18) said the best part of his experience was exploring California with his host family and roommate, including places like Napa Valley. Hernandez even ran the 2018 San Francisco Marathon, which allowed him to see some of the region’s iconic landmarks. Gaining exposure to cutting-edge technology is another aspect of the LLNL internship that students find unforgettable. 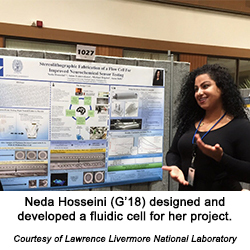 Neda Hosseini (G’18) designed and developed a fluidic cell that would be used to improve neurochemical sensor testing. To do this, Hosseini used computer-aided design software and stereolithography to develop the prototypes. She and her lab team then used her prototypes to test and improve the biosensors’ performance, which exponentially improved their effectiveness.The biosensors were designed by her LLNL team to conduct electrochemical stimulations and recordings of the brain.